Robert Hooke was an English scientist. He observed a slice 70-452 pdf of cork (bark from an oak tree) under his microscope. That microscope magnifieo 20 fimes (30x). Thus he first time described and named cells in 1665. He believed that these tiny boxes or “cells” were present only in cork Hooke never realized the significance of his discovery. He discovered microscopic organisms under his microscope. These organisms were single celled. He used grains of sand as a lens in his microscope. He polished these grains and formed magnifying glasses. This magnifying glass was as powerful as 300x. Leeuwenhoek discovered a microbial world in a drop of pond water. He also observed the blood cell and sperm cells of animals. Cell membrane: All cells are enclosed by a membrane. This membrane regulates the passage of materials between the cell and its surroundings. Cytoplasm: It is composed of soluble part called cytosol and cell organelles like mitochondria, Golgi bodies, Encloplasmic reticulum etc. 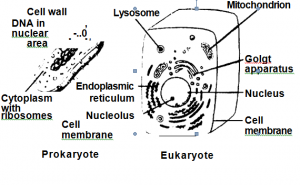 These organelles may be granular like ribosome or membranous bound like mitochondria Membranbus bound organelles are absent in prokaryotic cells.